It's easy to be confused when buying cooktops and any built-in products. The familiar and popular brands like GE, Whirlpool, Maytag, LG, and Samsung are not as strong in cooktops as freestanding and slide-in ranges. Thus, your decision is now based on less known specialists like Wolf, BlueStar, Thermador, Bosch, and Jenn-Air. As confusing as built-ins can be, you are comparing half of a stove. It is a much easier decision with that mindset than the rest of your kitchen decisions such as what kind of tiles, flooring, colors, and fixtures. This article will show you the best products and their differences. However, first, you should know the difference between a rangetop and cooktop as well as what to look for when buying a cooktop. You are probably confused about what the difference actually is, but this is how you should look at it: You are essentially comparing the top half of a professional range to the top half of a regular range. Rangetops look like a professional gas range without the oven below. The knobs sit on the front of the unit and they have a bulkier, more industrial appearance. They also are available with either a griddle or grill component in the larger 36, 48, and 60-inch units. Cooktops, on the other hand, sit on top of the counter with a more low-profile aesthetic. Traditionally, rangetops collectively had more powerful burners. However, cooktops on the market today have one or two professional burners and have a less expensive price tag. Unfortunately, there are installation issues on both. Rangetops have to be installed in the cabinet. It is hard to retrofit a rangetop in existing work. It is better planned with a cabinetmaker in new construction while cooktops are installed into the counter and are suitable for new and existing kitchens. Cleanup: Look for removable knobs and an upswept lip or rim to contain spills. 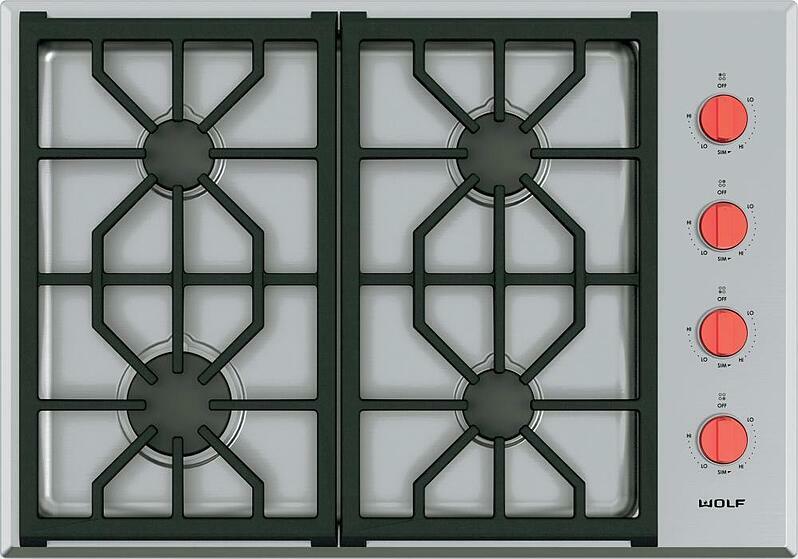 Look for sealed burners and grates that are dishwasher-safe. 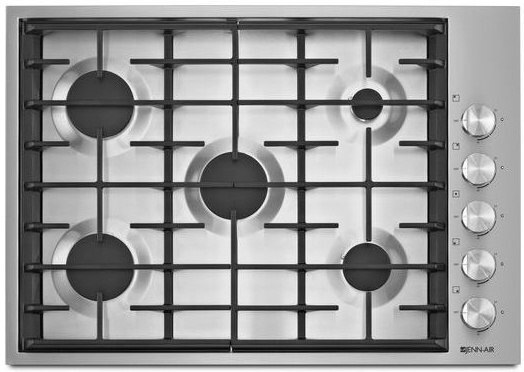 Burner Layout: Many cooktops come with burners specifically designed for low-heat tasks (like simmering) or high-heat tasks (boiling). There should be enough space between burners to use several pots at once without juggling them. Smaller burners should be in front so that you attend to tasks that require close attention, like simmering. Controls: Make sure they're easy to access and are legible. Touchpad (electric only) controls are easier to use than knobs or dials. Knobs on the front of the cook top (rather than the side) offer more cooking space and are further away from the burners. Making your hands less vulnerable to burns. They can also be easier for children to reach; some models have a push-in and turn feature for safety. Part of BSH Home Appliances Corporation, a fully owned subsidiary of BSH Bosch. Did you know they are the 3rd largest appliance manufacturer in the world? Founded in 1916 in California by William E. Cranston, and began as a manufacturer of electric items, most notably portable and built-in heaters. In 1932, Thermador established its appliance manufacturing as Cranston merged with business owner H.H. Fogwell to form the Thermador Electric Manufacturing Company. Thermador is now owned by the Bosch Company. 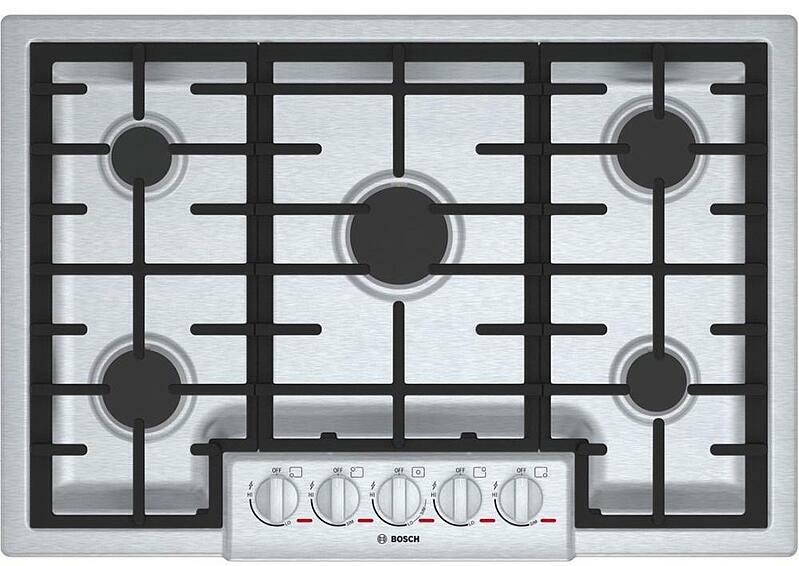 The Bosch Benchmark line launched in early 2014 as the premium line within the Bosch product line. The Sub-Zero Freezer Company was founded in 1945, by Westye F. Bakke in Madison, Wisconsin. For more than 70 years, Wolf has been synonymous with professional cooking equipment for restaurants and hotels. In March of 2000, the company became part of Sub-Zero and was adapted for the serious in-home cook. Adapting to an ever growing kitchen design segment. Sub-Zero, reinvested in Wolf and redesigned the line completely with better simmers and double convection technology in the ovens. The original Jenn-Air Products Company was founded by Louis J. Jenn in Indianapolis, Indiana in 1947, later becoming simply Jenn-Air. In the early years, the company focused on manufacturing and marketing of industrial fans for use in a variety of commercial and industrial applications. In 1961, Jenn-Air's integration of one of these fans to a cooktop range lead to the invention of the first self-ventilated downdraft range. The company grew its product line to include many other kitchen appliances including microwave ovens, refrigerators, dishwashers, and small appliances such as mixers and blenders. Unfortunately, the brand languished after being purchased by the Maytag company as well as the demand for downdrafts dissipating in the 1990s. With investment from Whirlpool, once again, Jenn-Air is a brand to be considered in the professional range category. BlueStar is a family-owned range company based in Pennsylvania. They have been around making solid cooking appliances since the 1880s manufacturing commerical looking ranges. They introduced theirfirst professional refrigerator in 2017 and have become more known for their powerhouse ranges and pure convection element. 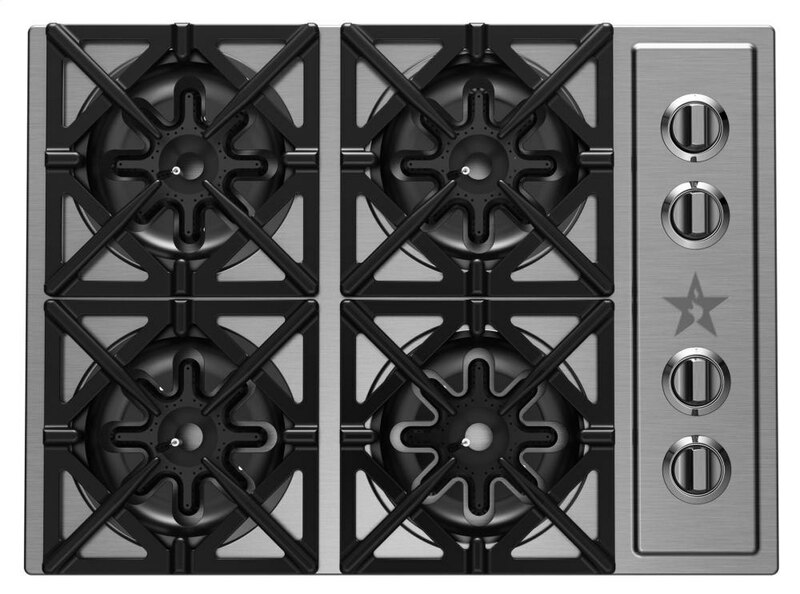 Cast Metal Knobs - These sleek controls offer substantial heft and precision while complementing the cooktop’s surface. Low-Profile Design - With an extremely low profile, you can have a minimal look —nearly flush with the countertop - for an integrated transition to the cooktop. 12,000 BTU Burner - Experience a sturdy burner that’s ideal for everyday cooking but can also be used for sautéing or pan-frying. 9,000 BTU Burner- A burner that reaches a maximum power level of 9,000 BTUs and fulfills most everyday cooking functions. Heavy-Duty Metal Knobs for a Premium Look and Feel – these are knobs are easy to turn, will not warp from the heat of the burners and are effortlessly removed for easy cleaning. Low-Profile Design for an Integrated Appearance – clean lines that make it easy to move your cooking vessel from one burner to another. Before you buy the BlueStar based on power alone, keep in mind the burner is open, so you have to lift the top to clean underneath. The other manufacturers have sealed burners. There is no clear winner for the very best so it's importnat to consider various components that best fit your lifestyle. Let's look at the major components you should consider and the winners for each. 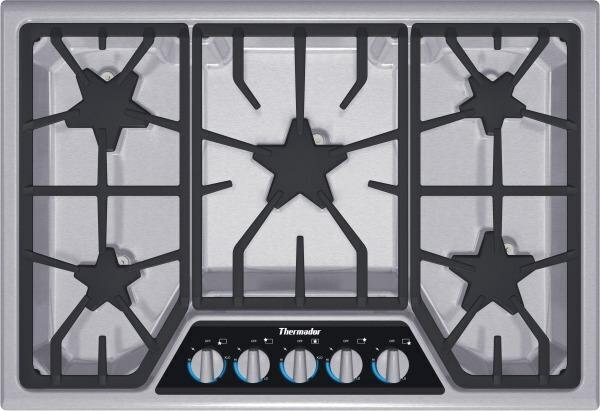 Thermador has the lowest simmer because they have an intermittent simmer to keep a low median temperature. Wolf has a 3-stage burner with a smaller flame from the top at the simmer setting with a low of 500 BTU versus 200 for Thermador. Wolf can simmer on all burners versus 2 on Thermador. BlueStar's 22,000 BTU burners is incredibly powerful albeit the cleaning component. You would have to vent accordingly. Bosch and Jenn-Air both have 20,000 BTUs on one burner (BlueStar has two). Jenn-Air's cooktop sits the most flush and is theoretically the easiest to clean. Bosch looks good for the price. Jenn-Air and Thermador have great rebate programs throughout the year. Wolf is the only manufacturer on our list of most reliable manufactures based on over 20,000 completed service calls. Ultimately, it depends on what you value. Remember a cooktop is only half a range. You are only comparing power, simmer, reliability, and price. Find the cooktop best suited for how you cook. 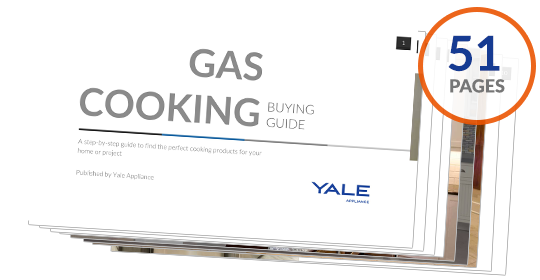 Download the Yale Gas Cooking Buyers Guide with specs, features, BTU outputs and buying tips. Almost 220,000 people have downloaded a Yale Guide.